Final Destination | Blooming Joy! I know where I’m going to end up. Actually, I know it in more than one way. I know where my body will go and where my soul will go when I die. These things are already decided. It’s somewhat strange to know my final destination at my age. I’m only 34. Most people don’t start to plan for these kinds of things until they are much older, or much sicker, than I am. There’s a reason why The Bucket List wasn’t cast with actors my age. This past weekend, I had the privilege of accompanying five incredible young people to a youth gathering given by our Lutheran churches here in Texas. I am always amazed by the faith that teenagers demonstrate and live out at these events. And I have been learning that Lutheran teenagers in the south feel very isolated. Apparently a lot of their Baptist and Pentecostal friends don’t believe that Lutherans are Christian. So for some of the youth, just being around other believers who believe in the same way was refreshing. Just thinking about that reminds me of some of my experiences with evangelical Christians as I was growing up. I would get asked the question, “Do you know where you’re going when you die?” I would say I was going to heaven, but they would keep pressing me. I don’t know what the purpose of these kinds of interrogation are, but I found them to result in raising a lot of doubts in me. Now, as an adult, I have some understanding of the theology behind these kinds of questions, but I don’t agree with it. Why on earth would it be helpful to make someone doubt their salvation? The beginning part of the story in this blog post breaks my heart, because I know that the writer is not the only one who experienced this, and many abandon the church permanently. If I doubted God’s grace, or the promise of heaven, my faith would be devastated by the losses we’ve experienced. Thanks be to God that He has given me the faith to trust in His promise, to know that my children are safe in His arms! I know that Christ died for me, to reconcile me to God. My relationship with Him is secure, and I have a home waiting for me in heaven. 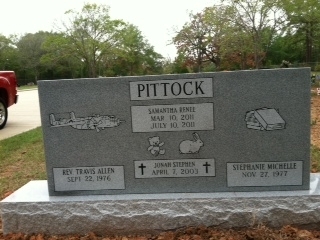 My body’s final resting place was chosen a little over a year ago, when we bought plots for ourselves and our children. But the final resting place of my soul was opened when Christ rose from the dead, and my name was written on the reservation on the day I was baptized. Samantha and Jonah will be waiting for me, but more importantly, Christ will be there with open arms to welcome me home! For everything that was written in the past was written to teach us,so that through endurance and the encouragement of the Scriptures we might have hope. May the God who gives endurance and encouragement give you a spirit of unity among yourselves as you follow Christ Jesus,so that with one heart and mouth you may glorify the God and Father of our Lord Jesus Christ. Endurance, encouragement, hope, unity – these are what we all need as Christians, and I pray I can uplift each of you with these posts to give you the endurance, encouragement, and hope that you need, as we glorify God with one heart and mouth. God bless you all! “We do not need to be afraid. Because to sing to God amidst all of this is to defiantly proclaim like Mary Magdalen did to the apostles, that death is simply not the final word. To defiantly say that a light shines in the darkness and the darkness cannot will not shall not overcome it. And so, evil be damned, because even as we go to the grave, still we make our song Alleluia. Alleluia. Alleluia. Wow. That was the last time you and I actually SAW each other in person. It’s been too long! Wow, I remember eating with you but I have no memory of that interaction whatsoever. I’m glad you remembered it! And yes, it HAS been too long, because I’m pretty sure Annalie wasn’t even born yet.